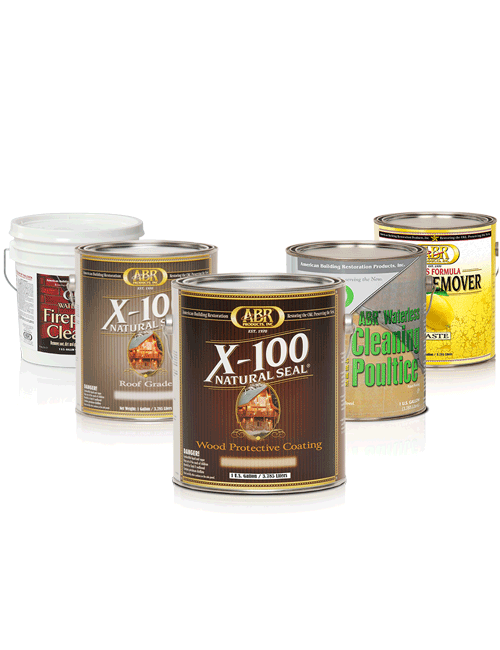 X-100 Natural Seal® Pre Finish™ is an oil-based, low VOC penetrant and stabilizer designed as the first step in a two-step process for use on horizontal and vertical wood surfaces. 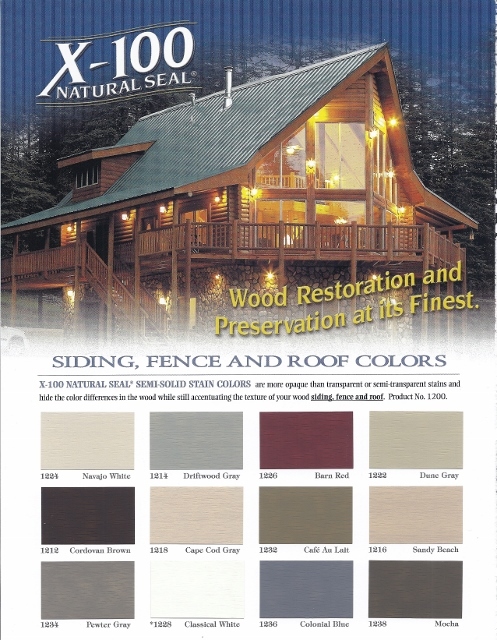 X-100 Natural Seal® Pre Finish™ is designed to protect wood from ultraviolet radiation, water intrusion, and ultimate log/wood degradation by integrating metallic UV inhibitors and zinc borates with water repellents within its formula. Scientific studies have shown that applying a UV log/wood pre-finish/stabilizer will ultimately protect future finishes from cracking, chipping, peeling, and fading. X-100 Natural Seal® Pre Finish™ extends color fastness while addressing certain harsh elevation and climate conditions. This is achieved by isolating certain solvent-borne wood stabilizing ingredients. These ingredients enable the X-100 Natural Seal® Pre Finish™ to penetrate the wood to deeper levels, enabling the colorant to migrate further within the wood, which ultimately extends the life of the finish. X-100 Natural Seal® Pre Finish™ stabilizes the wood, protecting the second semi-transparent coat by bonding with the initial pre-finished/stabilized wood. New, dense or unseasoned wood – 300 to 400 sq. ft. per gallon, depending on porosity of surface. Old, seasoned or weathered wood – 200 to 300 sq. ft. per gallon, depending on porosity of surface. Less than 550 grams per liter. One, five, and fifty-five gallon containers. 1. Clean with X-180 Weathered Wood Restorer™ or other ABR® Product. Finish™. 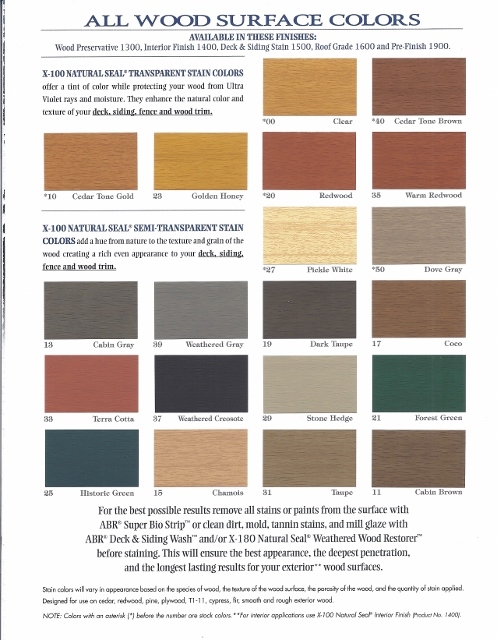 If color is desired, select from a wide variety of pre-mixed, ready-to-use X-100 Natural Seal® Pre Finish™ transparent and solid color stains. 3b. FOR DECKING: Once the X-100 Natural Seal® Pre Finish™ is applied, your wood has sufficient protection for 1-3 years before applying an additional *maintenance coat of X-100 Natural Seal® Pre Finish™. (It is not required to apply a finish coat on decking.) *Maintenance coat for decks is defined as a thin wiped on, smoothed out application and is great for rejuvenating color! It is recommended to clean all surfaces with ABR® Deck and Siding Wash on an annual basis or as needed and always before reapplication of X-100 Natural Seal® products. Follow the complete X-100 Natural Seal® product specification sheets for detailed instructions. product. NOTE: Before beginning the overall stripping project, test panels should always be made on all elevations to conclude satisfactory performance and dwell time. Follow the complete ABR® product instructions. 2. Follow Steps 1-3 as stated above. time, wood porosity and total desired look. 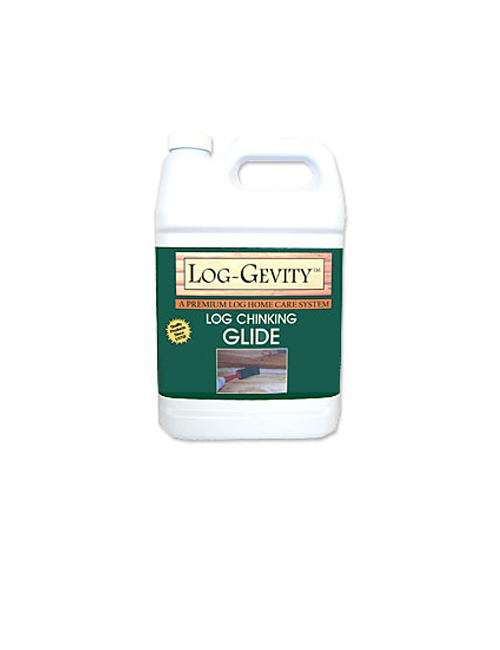 handled staining pad or low pressure sprayer. Work vigorously into all surfaces. If using a low pressure sprayer always back brush into surface. Do not allow product to puddle. Wipe off excess product. wood will absorb to reach a uniform appearance. NOTE: The same piece of wood may absorb differently in areas, so it may require a wet on wet application to even out penetration. 3. Keep a wet edge to avoid lap marks. CAUTION: Use extreme caution while walking on a horizontal surface during application. Horizontal surfaces can become slippery during and just after product application. Each wood surface may have different dry times due to wood porosity. 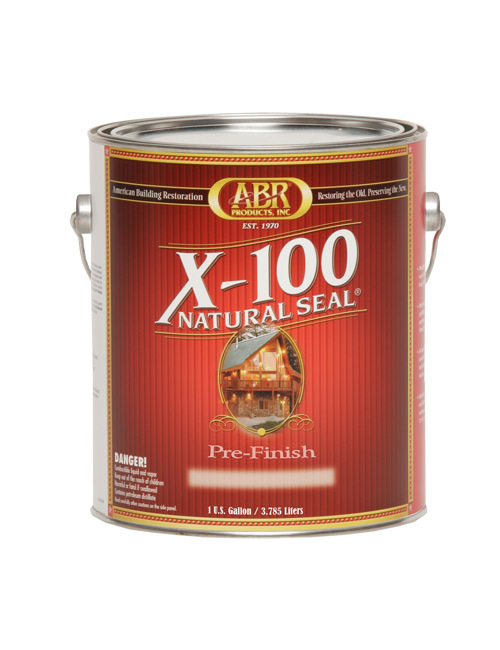 Under optimal conditions X-100 Natural Seal® Pre Finish™ will flash dry in approximately 30 minutes. Always check wood surfaces prior to usage. Use mineral spirits or dish detergent and water. Should X-100 Natural Seal® Pre Finish™ come in contact with surfaces such as glass, paint, metal, caulking or rubber, remove immediately with dish detergent. If a spill is dry, clean it with mineral spirits.